The Design Boards: What's on your reading list? I'm making good use of the library these days for some of our home projects. I checked out some books on upholstery which are even better than I expected them to be. I'm going to order the upholstering tools this week so I can start working on the couch. Judging from the instructions in the books, it doesn't look like it will be too difficult to do and if this works I am going to tackle two armchairs that we absolutely love but we aren't really feeling the fabric choice anymore. 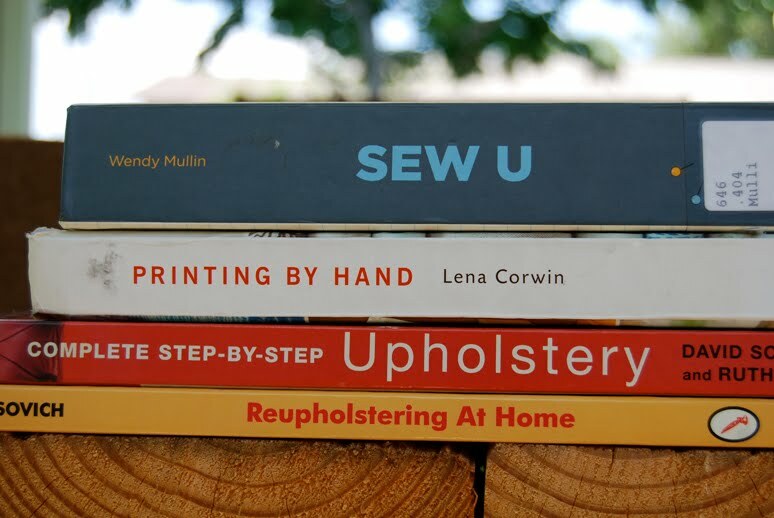 I've had Sew U and Printing by Hand on my Amazon wish list for months but wanted to check them out from the library before committing to buy them. I really want to learn how to sew my own clothes and while I am pretty good at home decor sewing projects, clothing is a whole other ball game. I'm also looking for some printing inspiration as I really love screen printing but never get a chance to do any. Both of these books have inspired me to start some new projects. What's on your reading list these days?